My apologies for the delay in publishing this summary to end this review but the recent stormy weather exposed roofing problems! 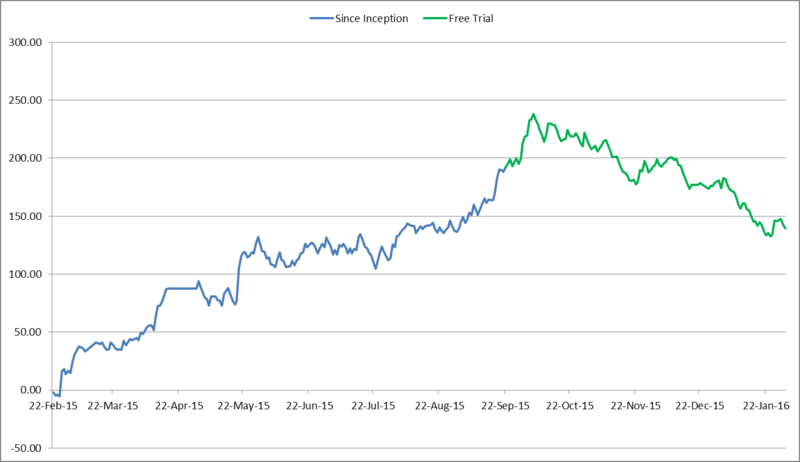 The blue line is the result of my monitoring before the free trial and the green line the free trial results. As you can see it all started well but then went into a downturn that it never recovered from. 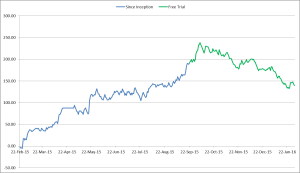 🙁 But, at the end of the day it has made a profit of +139 points over the period of my monitoring so I couldn’t give it a fail rating. I’m sure from what I’ve seen from Gary over the longer term since I started to monitor his tips that it will bounce back and I’ve therefore given it a Neutral rating and will continue to monitor it in the hope the results recover (just as they have done with BRBB). I’ll report back from time to time. So for now it just leaves me to say: thanks for following, it was a rocky but interesting ride and thanks to Gary for sharing his tips with us.